i can’t believe how lucky i am! 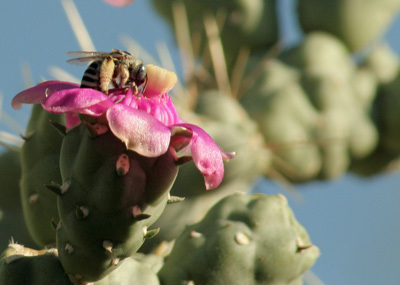 for the second year in a row there is an aggregation of one of my favorite bees…the agapostemon! they’re back, and this time….i have a macro on hand! last year we discovered them in august and they hung around till mid november, numbers dwindling near the end of that time. it was sad. i didn’t want them to leave. i was sure the next generation wouldn’t approve of my trees. but they’ve returned. two nights in a row they have been on the same branch, a bunch of males, just under 50 or so, bedding down for the night. (last year they were on a tree right next to them on a slightly lower branch. around 10pm the bulk of the bees have landed. they spend much of the night walking over eachother, looking for the perfect spot. late into the night they settle down into a deep sleep, eyes still appearing to be open, but antennae dropped in slumber. they’re early risers, gone before i wake up around 6-6:30 ish. i feel very lucky to have this interesting wildlife situation right outside my back door. oh, and by the way…if you want to see other photos of small things from nature, you can visit my photoblog. small. eyes like jewels. but small. i have all these new bee pix…and i took them with buzzy’s macro. so i’ll show you the pix, then i’ll show you them with…THE PEN. our signature move: the bee with the papermate ballpoint pen….so you can see how tiny these little guys are! the bee is smaller than the head of my ball point pen! all of these bees are sleeping. awake…they’re just to hard to capture in a photograph. so small and quick. i will be posting bees regularly at my new blog: digitalmuzzle.wordpress.com and as always, you can learn heaps about bees at buzzybeegirl! oh and hey!…these pix are copywritten! these….are the bees of our lives…. it is important to note that when photographing bees, you should wear pants, not boxer shorts….because the mosquitos get jealous and they eat you. they try to ruin your shots of the very cool bees by making you slap your own legs. tonight there was frenzied bee activity in my backyard! it was incredible! 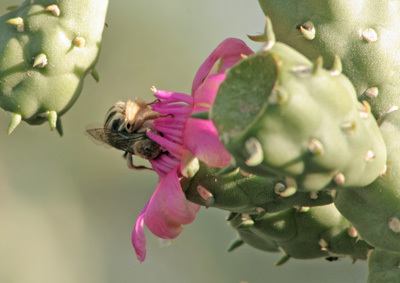 native bees, not the bees you eradicate…. 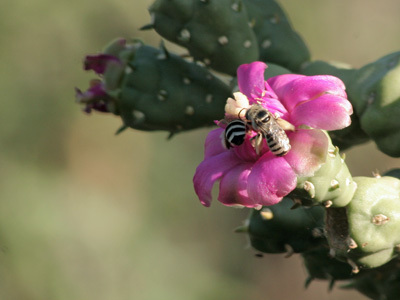 oh, and yes, that is a cholla blossom. lovely, isn’t it. i wish i was a better photographer. 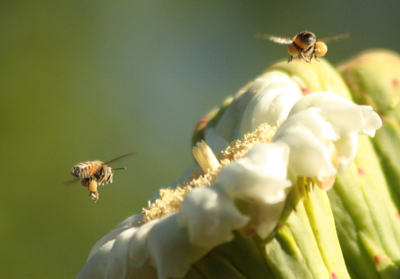 i struggle with manual focus, especially on these fast moving bees. i was having so much fun taking pictures, only to be disappointed later to see how the shots didn’t do the bees or the flowers and lighting any justice. but still. it was exciting. i’m so fortunate to have such great bee activity! 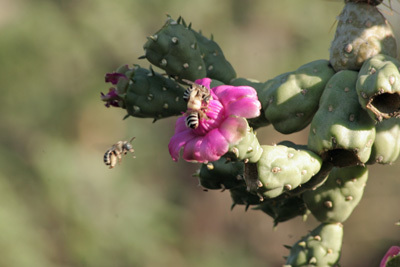 for more of my bee shots and bee posts, type “bees” in the search bar on the left. and thanks for stopping by the blog! 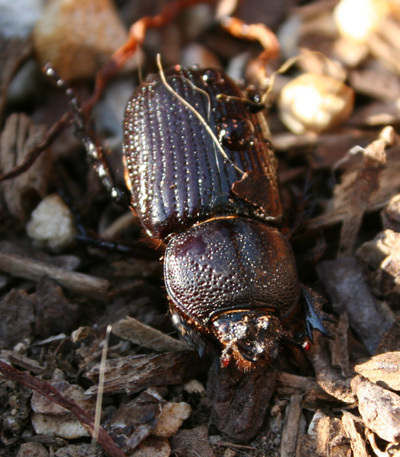 there’s beetle in this post! but don’t be scarobed! it’s a nice beetle. 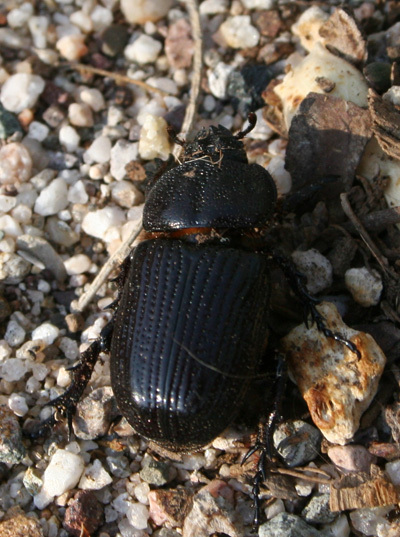 i found a beetle yesterday morning. i was very excited to see him. he had to be moved to safety…before pickles devoured him. goodbear: I believe it is a Platyceroides agassii. Will send an email with 3 low res photos for you to investigate. Maybe we can do another bug high five! buzzy: It is a Platyceroides!! goodbear: high five!! isn’t there a shorter name for it? i can’t put THAT on my blog. please tell me he is a very rare and special beetle! did you ever know an entomologist could be so sweet!? but you don’t need to know that! you just want to know how to identify your insect, right? click on the bug that looks most like yours and follow it to the specific bug. oops. not BUG. THEY’RE INSECTS! the spines shimmer like platinum in the sun! it’s the hubbard’s silk moth caterpillar. i’m not home now, but i do have a picture of an adult moth that we lucked out to find on our fantastic bug night! (more here, too) on my pc at home. will post tomorrow. 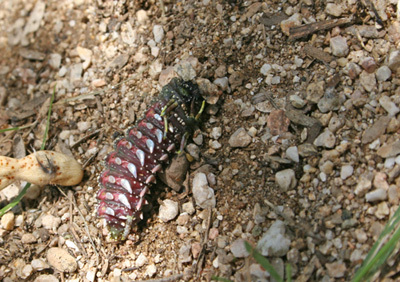 the caterpillar’s body was fuschia and he had shimmery plates of silver. his head, tail and underbelly were a crayola type green. i’m psyched with my find. i think it’s rare to find caterpillars in a world where we seldom look to the leaves. or in this case on the ground hiding in seed pods. still enjoying housesitting. got their laptop to work a bit! loving animal planet’s mini marathon of animal cops and the dogs are all getting along so well.